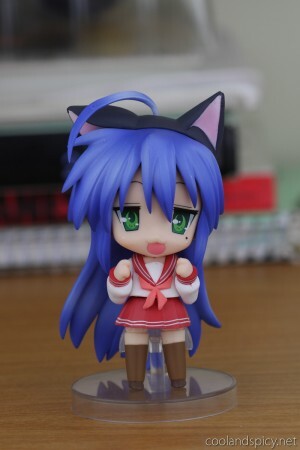 Just a quick look at one of my not so recent Nendoroid acquisitions. Yep, another Konata ^^; This one is special though. It’s the Comptiq version which was a Comptiq magazine exclusive and thus getting a hold of one is more difficult. They pop up on Ebay every now and then but are always posted at insane prices so I went to Yahoo! Japan Auctions and got one there for a pretty reasonable price ^^. 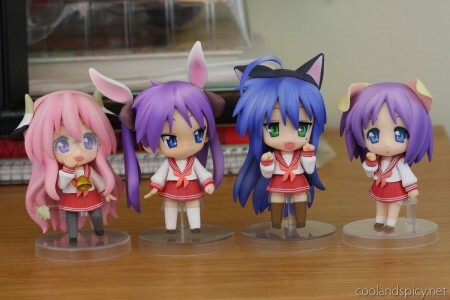 As with the Comptiq versions of Kagami, Tsukasa and Miyuki, Konata comes with accessories for her animal persona. 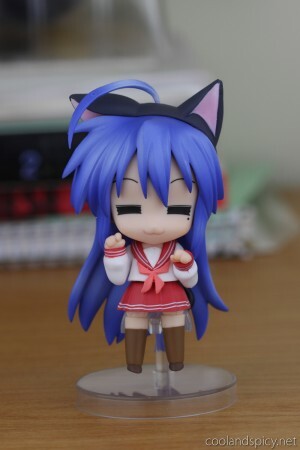 Konata’s animal is, of course, a cat :) She comes with cat ears and a little tail. 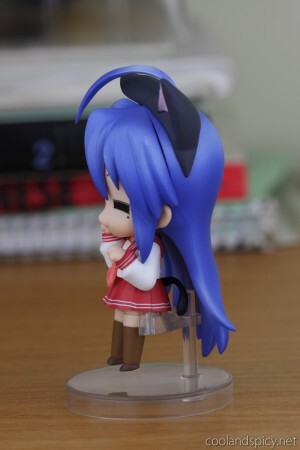 Konata comes with 3 faces, 3 skirts, 4 arms, standing and sitting legs, and a chair.Oh, also an unpainted Akira puchi Nendoroid but I already had the painted version of her from the season 1 petite Nendoroid set. 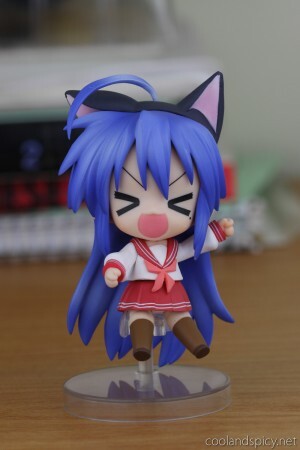 If you’re interested in getting this Nendoroid, it is number 27a. Just be careful, there are lots of fake 27a Nendoroids on Ebay. Those that are real and from legitimite sellers are often way overpriced. You might be able to do what I did and get her cheaper on Yahoo! Japan Auctions even after deputy service fees. You got 4 Kagamis but you’re missing one? Pretty confusing. The one I am missing the HP Version. .-= Leonia´s last blog ..Autopsie du plastique ! (Merlin) =-. 4th? there are 5 Kagamis: Rin cosplay, Miku cosplay, your awesome Kagami, my amiami Kagami and the HP Kagami. I love all the set completed. Congratulations. ohh…i thought she meant the exclusive ones only. I saw a few in Hong Kong. They were quite cheap and u betcha, fake, fake and FAKE!!!! .-= Optic´s last blog ..Sydney Supanova 09: Part 1 =-.